Levan, after his visit to Georgia Dimitri Silaev said that Georgia is preparing a huge Monster for Trubin. Are you really in such a shape? - I’m training not only for Trubin, but for the Worlds as well. I am really in a very good shape and I’m going to be at my peak in November. How can your participation in the WAF World Championship affect your performance in Vendetta ALL Stars? The WAF World Championship is very important for me and I'm not going to miss this competition even if this affects my preparation for Vendetta in some way. I hope I will go through the Worlds without injuries and I will be preparing specifically for Dimitri Trubin. As you know, during the tournament in Croatia, Dimitri Trubin injured his left hand. Do you think it could affect his general shape somehow? - I do not think that such a trauma can affect his overall shape. What are your plans for vacation? How does the Georgian Hulk rest? Nature, barbecue? I will have a couple of days to spend time with my friends. We usually have a good barbecue and also we have sulfur baths. I will not rest after the Worlds, I will dedicate my life to my arm, and I will do my best to make my fans happy. 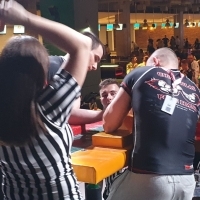 "Zloty Tur" World Cup vs Armfight: What is more important?